Vasile Russ was born in Boian Bukovina in 1878. 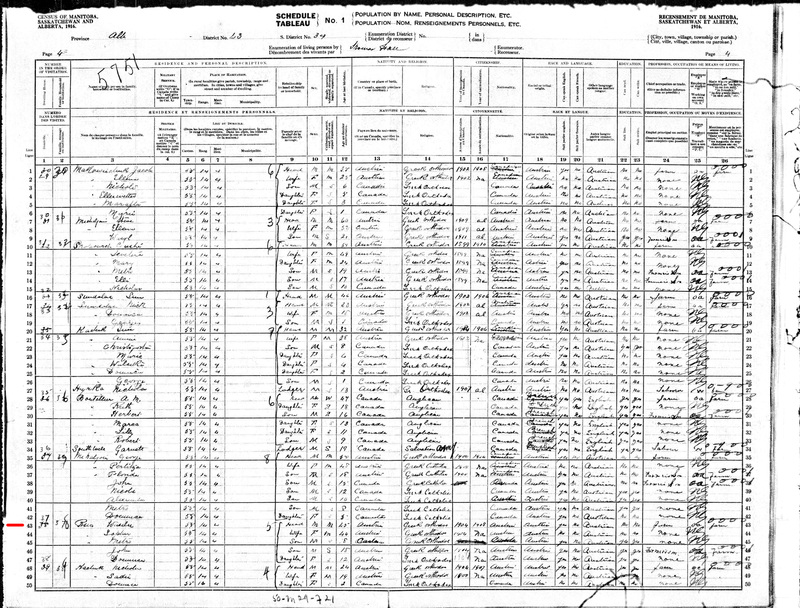 In 1898 he married Sophia Holowity and in 1911 they emigrated to Canada, a distant unknown land, with their first born son, Tom. Like all newcomers when they arrived they lived in a hurriedly constructed sod house (bordei) on a homestead in the Soda Lake district. Three more children were born here. Tom married Pachija Porozni in 1916 and settled on a farm in the heart of the Boian Marea S.D. #2053. There Tom and Pachija brought up five daughters – Anne, Helen, Dorothy, Mary and Sally. Their only son, George, died as an infant. 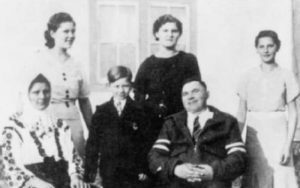 Tom Russ and his family operated the Boian Post Office from 1927 to 1941 and carried the mail from Boian and Shalka Post Offices to the main post office in Hairy Hill. During the depression of the thirties, three of their daughters had the courage to venture at an early age to the metropolis of Montreal and make their livelihood there for several years. Helen left in 1936 and became a seamstress. Dorothy went in 1937 and was employed as a secretary in the C.P.R. office. Mary followed in 1938 and worked as a salad girl at the C.P.R. hotel. Anne, the eldest, married Bill Mascaluk, a for-mer boxer and farmer, They had five children. Helen died at 25 in 1943 of a heart condition. Dorothy married Fred Markowski, a furrier in Edmonton. Mary married Steve Semeniuk who worked for Independent Wholesale. They have two children – A1 is a car salesman, and Briggette is an assistant District Agriculturist in Red Deer area. Sally married George Iftody, a prosperous farmer in Boian. The couple was blessed with two daughters. Elaine became a school teacher and is presently acting principal in one of the schools at Stony Plain. Marsha Gail is a social worker and probation officer in Edmonton. John Russ, the second son of Vasile and Sophia, married Velma Koles and settled on a farm near Willingdon. 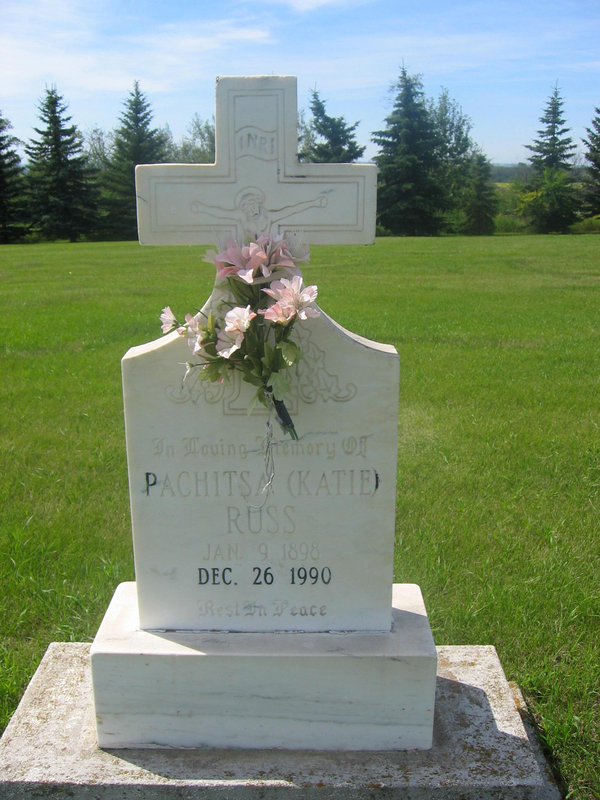 They had three sons and a daughter Kathleen. Domnica, the only daughter of Vasile and Sophia, married Timofy and lived in Vancouver. The spirit of these early settlers is out there in the open country where the first Romanian pioneers settled. They came to create a new world in a virgin land. Some may say that they failed, but it is in their failures, as well as in their success, that the history and romance of the beautiful community named Boian is to be found. Vasile was born on Sept.9, 1877. Father – Petru, son of Stefan Rusu. Mother – Vasilca Bujenita. Godmother – Maria, daughter of Toader Nescoromni.